Primary research in education and social sciences is marked by a diversity of methods and perspectives. How can we accommodate and reflect such diversity at the level of synthesizing research? What are the critical methodological decisions in the process of a research synthesis, and how do these decisions open up certain possibilities, while closing down others? This book draws upon methodologically diverse literature on research synthesis methods and primary research methods to develop a framework for synthesizing research. It presents a Methodologically Inclusive Research Synthesis framework to facilitate critical and informed decision-making among the producers and users of research synthesis. 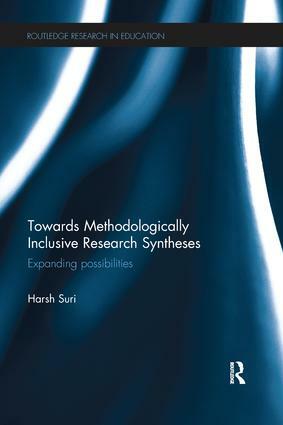 A wide range of techniques and perspectives from postpositivist, interpretive, participatory, critical and postmodern traditions are considered in the book, and Suri opens up new areas of debate by exploring numerous aspects of research syntheses from a methodologically inclusive perspective. The book will be valuable reading for researchers and postgraduates in education and social sciences.